And salon owners are now protesting new policies that aim to protect workers and consumers from chemical contamination. You’d think the idea of making nail salons a little less toxic wouldn’t be a particularly controversial proposition. In New York, of course, it’s a different story. New policies to improve ventilation in the state’s thousands of nail salons is one modest measure by regulators to protect worker and consumer health in low-budget beauty shops notorious for toxic-chemical contamination. Yet business owners are protesting on the grounds that mandating cleaner air could stifle their American Dream. The tensions among workers, employers, and the state reflect the challenges of labor enforcement in many under-regulated low-wage industries: not just in getting the right laws on the books, but engaging diverse communities and navigating local political fissures. Since its launch last year, New York Governor Andrew Cuomo’s Exploited Workers Task Force has tightened labor oversight of low-wage jobs like construction and domestic work, and its targeted efforts toward nail salons could be a model for other states and cities that are trying to push higher minimum wages and enact other labor reforms in under-regulated service industries. The task force reported in July that it had over the past year investigated “3,000 claims, affecting more than 7,700 workers in 12 industries,” including 247 enforcement cases against restaurants, 491 investigations on farms, and 440 cases in construction—primarily dealing with issues like wage theft and occupational-safety violations—coupled with training and education efforts. Altogether, the Governor’s Office reports that last year “businesses were directed to pay a record $31.5 million in unpaid wages and damages to workers,” which is up from a total of $13.1 million paid out in 2007. The task force’s flagship campaign has targeted the nail-salon industry, following an exposé by The New York Times revealing rampant labor exploitation and unhealthy conditions on the job. The state has investigated 480 claims involving nail-salon workers and “directed 143 nail salons to pay $2 million in unpaid wages and damages to 652 employees.” And some of the strongest backlash has come from nail-salon owners, many representing New York City’s rising Asian-American middle-class, who feel unfairly targeted. Still, the new ventilation standards shouldn’t be controversial. The rules are backed by an extensive research review citing hazardous contaminants commonly found in nail-care products, including toluene, formaldehyde, and other substances that “may be associated with various respiratory, musculoskeletal, and neuropsychological symptoms” and reproductive-health issues. The state’s requirements are based on established industry standards, including both ventilation equipment and personal respiratory masks. 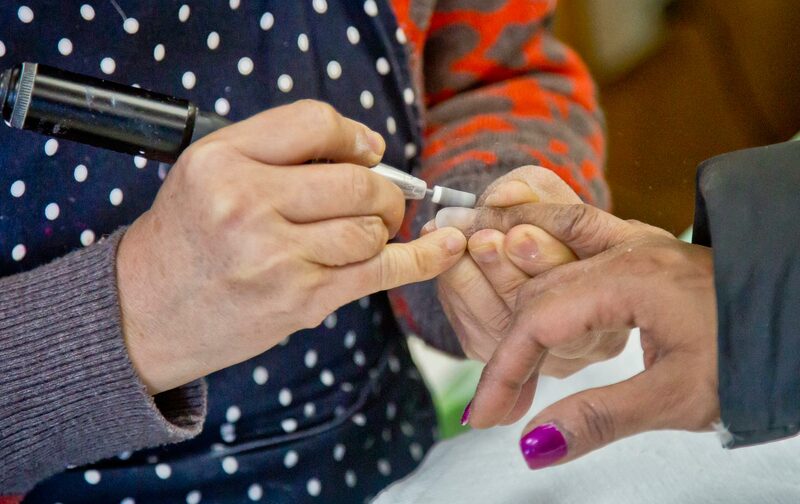 The standards actually mirror those already in place in San Francisco, where a community-based “healthy nail salon” program has for years been ramping up health protections, with strong support from both workers and employers in the largely Vietnamese-owned shops. The state’s task force is pioneering a more comprehensive model of worker protection, Obernaer adds, by “looking at the intersection between public health and worker health.” This approach in turn “innovatively gets around federal exemption issues,” since federal authorities typically regulate workplace health and safety issues, but state regulators can tackle interconnected forms of labor exploitation tied to public health. They are now strengthening regulations on the state’s dry cleaners and car washes, sectors that, like nail salons, also center around smaller shop owners and low-wage immigrant workforces. So both labor strife and employer pushback could rise as regulatory efforts expand. But despite the rhetoric in defense of humble “mom-and-pop shops,” it’s precisely these employers who need to be reined in. While they may appeal to public sympathies as immigrant strivers, it’s the exploited workers who deserve solidarity above all. Our economy is rife with big-box retailers and global multinationals, but the fact that some abusive low-wage businesses reflect New York’s humbler middle-class economic strata does not exempt employers from responsibilities to treat their workers justly. Exploitative hierarchies can exist within and across immigrant groups or communities of color. No job is worth any worker’s life, especially not when the price of protection simply means paying the full cost of a cheap manicure.